will Simply Rock Your World! Let me start by saying that Guitar Hero Wii (Legends of Rock) is currently my favourite game and I’m struggling to put it down for a minute! This is undoubtedly one of the best party games around and you'll have hours upon hours of fun with your friends, no matter what age you are. 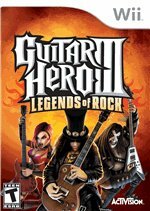 If you love music or you love listening to music with friends, then you'll absolutely love Guitar Hero Legends of Rock. 2 at the same time but great fun with lots of people! Using a plastic replica guitar made specifically for Guitar Hero Wii, you're the lead guitarist in a small rock band. The aim of the game is to help your band become international rock stars by successfully playing through each song in the game. Guitar Hero for Wii comes with over 70 classic rock songs, and there's an Easy setting if you've never played a Wii Guitar Hero game before. "Wow" is probably the best word to describe Guitar Hero Wii (Legends of Rock). It is simply a great party game! The music, graphics and atmosphere are spectacular and everyone in the room will start bouncing to the tunes as soon as you turn it on. A friend of ours brought over her Guitar Hero game for us to play a few weeks ago. Everyone was totally blown away that night, and I was out the next morning to buy my own Guitar Hero Wii. The Guitar Hero Wii story is a basic one. You're the main guitarist in a rock band and you want to become a Rock Star. As you shred your chords and rock the crowds, your band will move from small town rockers to international superstars. In the box you'll get the Guitar Hero Wii (Legends of Rock) game and a Gibson Les Paul replica plastic guitar that acts as the controller for the game. The Wii remote controller plugs into the guitar acting as a motion sensor (you'll get rewards for swinging your axe around) and an extra speaker. The guitar has coloured buttons on the neck that you'll need to push to play musical notes. As your band rocks through a song, coloured notes appear on the screen. Your job as the lead guitarist is to hit the right notes at the right time. You'll do this by pushing the coloured buttons on your guitar in time to the coloured notes on the screen. Hit all the right notes and the crowd goes wild! Miss a few notes too many and the crowd will let you know it. If you lose the plot completely, your band stops playing and you'll suffer the shame of having to start the song from the beginning. For newcomers to the game there's a Tutorial section and a Practice area. These areas of the game will teach you everything you need to know about Guitar Hero Wii before playing in front of a live audience. The Tutorial section will teach you how the game works and how to use the guitar controller. The Practice section lets you practice real songs, at slower speeds, to let you get the hang of the game. When you're ready to jump into the action there's an Easy playing level waiting for you. On the Easy level you'll get a smaller selection of notes to hit, and you'll quickly learn the basics of the game. As your guitar skills improve, the Medium, Hard and Expert levels will keep you challenged for months on end. Guitar Hero for Wii comes with over 70 songs on the disc (most are original versions and some are cover versions) and there's an amazing thrill to playing the guitar to songs that you've always belted out in the shower, in the car or at a karaoke night. Most of the songs that come with the game are locked and you'll gain access to all of these songs as you play through the Career Mode of the game. Career Mode is one of the two main modes of play in Guitar Hero Wii (the other mode is called "Quick Play"). In Career Mode, you'll choose a name for your band, choose an onstage character, and start your career playing at small parties. After successfully playing through your first set of songs, you'll be ready to move onto a bigger stage (if you're good enough, you may even get signed by an agent). In each stage of your career you'll get to play a cool new venue. Every venue has totally unique stage sets, crowds and atmosphere. These venues are pretty awesome and you'll definitely feel like a superstar once you hit the really big stages. At each stage of your career you'll get a choice of four new songs to play (these four songs become "unlocked" in the game and you can play them any time you like). To move to the next stage of your career, you'll need to successfully complete any three of the four songs, plus an encore performance (with the promise of bigger venues, audiences, and sponsors as the prize!). Every time you successfully complete a song, you'll earn cash to spend at the in-game Guitar Hero Wii store. After every performance you'll get a rating out of 5-stars. The higher your rating, the more money you'll earn in the game. In the Guitar Hero Wii store you'll find new guitars for your onstage character, new songs you can play in the game, and even new onstage characters. The more cash you earn, the more goodies you can buy! Quick Play Mode is the second way of playing Guitar Hero Wii. Quick Play is designed to let you jump right into the action without setting up bands and creating characters. This is the game mode you'll probably use when you have a group of mates over. Quick Play is a really great party mode. Letting everyone play a song or two before passing the guitar around works brilliantly. The venues, guitar characters and crowds change with every song, which keeps it fresh and fun all night long. Every song in Quick Play has a Top 5 leaderboard and it's great fun seeing who can make it to Number 1. A little bit of competition always adds some fun to the party! No game is perfect, and Guitar Hero Wii does have some frustrations. The Easy gameplay setting is a great place to start for newcomers to the Guitar Hero Wii game. Moving up to the Medium setting, however, is a tougher challenge! The Guitar Hero Wii guitar comes with five coloured buttons on the neck of the guitar. On the Easy setting you'll only need to push three of these buttons during a song. On the Medium setting you'll need to push four buttons during a song, and the notes come at you faster. There's a really steep learning curve when you jump up to the Medium setting, and you'll need to spend some time in the Practice area getting used to moving your fingers across four buttons. In the Practice area you can slow down the speed of the songs. This lets you practice using four fingers to play without worrying about the notes rushing at you. If you like playing games online, another minor disappointment is the lack of online features for the Guitar Hero Wii version. On the Playstation 3 and Xbox 360 versions of Guitar Hero Legends of Rock, you can play against other people online and purchase new songs through the online stores. The Wii's lack of storage space (the Wii doesn't have a hard drive) means that you can't purchase and download any extra songs to enhance the Guitar Hero Wii experience even further. With over 70 songs on the disc you won't be getting bored any time soon, but you'll grumble a little that you can't add some of your own favourite songs to the mix. Guitar Hero Wii (Legends of Rock) is a definite smash hit! My wife and I each have our own bands and we're racing to see who can finish the game first. Saturday night at our place is the new Rock & Roll. Our friends come over, we put on the game, and we jam the night away. If you're looking for a great party game to play with friends, then Guitar Hero Wii (Legends of Rock) is a must buy, and is on my Top 10 List of best Wii games. It's a little pricier than other games (see Amazon in the US and Amazon.co.uk in the UK for pricing) because you get the guitar included with the game. When weighing up the cost of the game against the endless hours of fun you'll have playing with your mates, though, it's definitely worth the money. With hours and hours of fun guaranteed, and the thrill of playing along to your favourite rock songs, Guitar Hero Wii (Legends of Rock) should be at the top of your "To Buy" chart. Note: The songs in Guitar Hero Wii (Legends of Rock) may differ slightly between different countries. The European version has additional songs to give it a more Eurocentric appeal. Guitar Hero Wii is one of many great Wii games, find more games from the main Wii Games page. Download your Free copy of my "Max Out Your Wii Console" book packed with articles that let you take your Wii to the limit.